Since 1925, Prater has utilized the most advanced technology and innovative solutions to create state-of-the-art Hammer Mill and size reduction products that are used around the world. Our exclusive G-Series, Full Screen, Hammer Mill is specifically designed for applications that require high capacities, power efficiency and uniform particle size. This provides our customers with confidence in knowing that we have the ideal machine for their unique particle reduction applications. Our exclusive Full Screen design is a proven system that ensures use of the entire available screen area which enhances end product quality and hammer mill productivity. 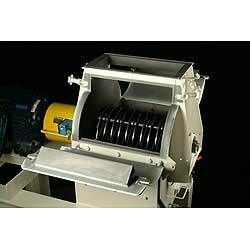 Hammer mill screens are strategically placed where extensive testing has shown the majority of milling and grinding takes place. This optimal placement increases throughput capacity without increasing power requirements and other costs. The design also simplifies screen changes by improving access to working parts. The center feed and fully symmetrical rotors distribute the product across the full width of the screen area for even hammer wear. This allows the rotor to be reversed so that both edges of the hammers can be utilized before replacement is required. Correct clearance between hammers and screens is maintained by mounting all screens in heavy-duty frames. Rotors are wider for varied hammer arrangements, and are all supported between durable pillow block bearings. These proprietary design factors combine to provide a controlled, uniform granular grind with the benefits of easy maintenance. View/print Full Screen Hammer Mill product information document here.